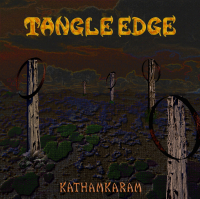 Tangle Edge returns with their 2nd vinyl release in 3 years. This record features 3 tracks in 34 minutes with a fantastic gatefold sleeve and excellent sound and as always was recorded at the bands studio outside of Narvik. If you are not familiar with this old Norwegian band, they play instrumental progressive, rock, jazz, psychedelic music to challenge the listener. Sit back and relax when you put the needle down for the 17 minute Dance of the Cantharides on side A. it starts slowly as Ronald, Hasse and Tom slowly come together in what will be come quite jazzy. You can hear some hand drums at the beginning of the track. The jam is very much lead by Ronald’s guitar playing as Hasse and Tom interweave (slowly). Ronald really decided to take off ¾ of the way through with some fantastic guitar work. Side B starts off with Xerxes Apposition and some backwards effects start the track and much more intense bass line dominates as Ronald solos over the top. You can hear a synthesizer/electronics at a low level in the background. Fantastic solo by Ronald and he really starts to use some effects the end to modulate his sound. The track dies out with an interesting synthesizer ending. Glass Dryad, a track a little over 8 minutes ends the record. This track is more like the side A track and quite jazzy and focused on Ronald’s lead guitar noodlings (good ones). The band plays in a special focused way that is hard to explain. The end also features some special sounds as the guitar lines fade out over the bass and drum playing. Interesting album. The band has also released a 7” of some classic material from the 80’s in a limited edition of only 200 copies on this same record label. I will review it when I get my copies that I ordered.